Nguyen Quoc Chanh is an acclaimed poet, admired by his peers and audiences in Vietnam and overseas. His first collection of poems was published in 1990 and his work has been translated into many languages. 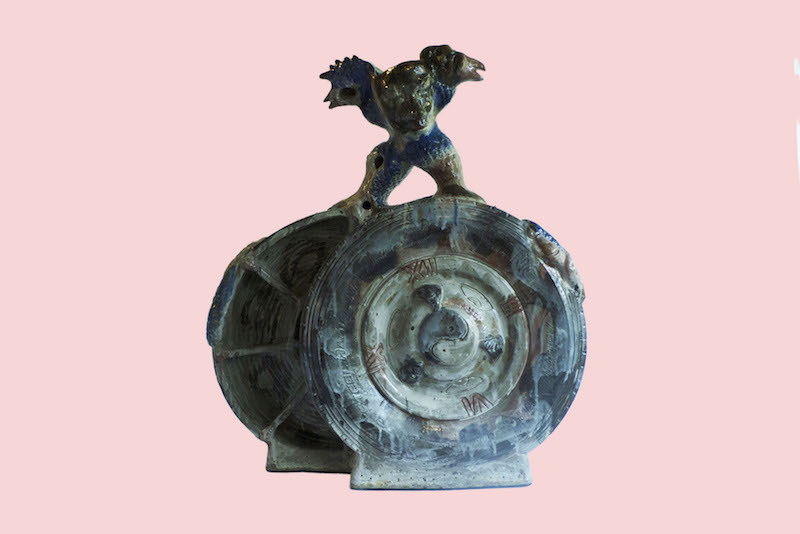 For Chanh to align his latest series of ceramic sculptures with the idea of a ‘guerrilla’ mentality is to place them firmly within Vietnamese history and cultural memory. To understand this process, just swap the image of a jungle soldier, living opportunistically within their environment and replace it with an artist whose materials are found and requisitioned. What emerges are assemblages that fuse multiple symbols, removing them of their positions in conventions that produce individual hegemonic meanings. At a glance, it seems chaotic, but the Guerrilla is always forced to deal in chaos until balance is reached. As Chanh himself suggests, balance is the mouse that skitters between conventional lines and the cat is yet to swallow it. If the pieces tell a story, then it is one that transcends the confinements of genre and style. 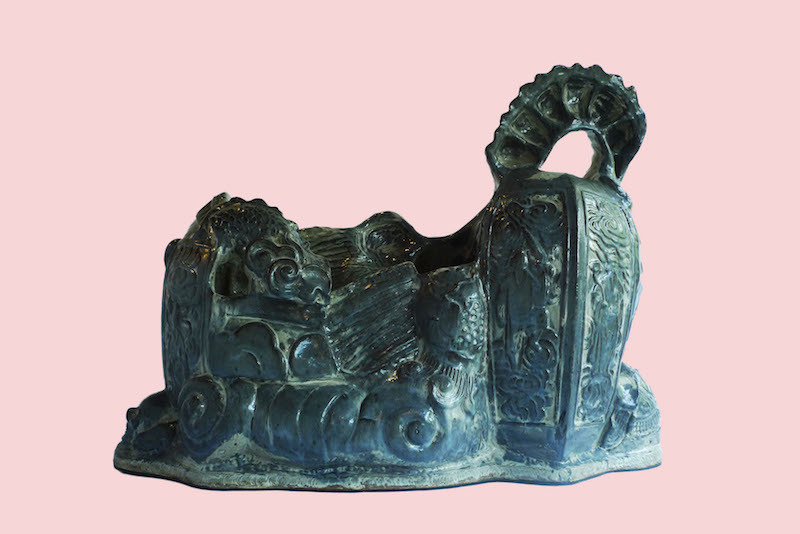 We can see that the moulds have diverse influences: folkloric symbols in Dong Ho woodcut paintings, the serene faces of The Bayon at Angkor Thom and Easter Island. Often, they are not made by Chanh himself, but were found—gathering dust in his adopted studio in Bien Hoa. In this way, the pieces proceed from multiple histories and are shaped by generations of artisans in different cultural and political contexts. In Chanh’s Guerrilla operation, they now become material for new purposes, positioned alongside more contemporary symbols on a shared substrate: casts of credit cards, face molds of football-playing children and images borrowed from the facets of Ben Thanh Market. In collecting these tools, he acts as a gatherer and a disruptor. The recognizable motifs must exist in relation to each other and are rendered unfamiliar in a state of disorder and uncertainty. A surreal and alluring effect is achieved. The pieces take on two main structural forms. Many of them have an outline we can discern easily: a large pot, a car’s tire or Cham Lingus. These stand in contrast to more surrealist shapes. Bulging and unrecognizable, they express a powerful conception of poetry whereby internal flow is more important than outward conventional beauty. Here, Chanh chooses a symbol and allows it to form the basis of the next, like stanzas building on one another. Indeed, he is a recognized poet and in this series, swaps language for the living form of earth and fire. Like a bird building a nest, he rounds off the final shape in a way that hides the process. It is unclear which part eventually forms the whole. Look again at the more conventional shapes in the series and they appear prosaic by comparison. It is unique for the pieces in a collection to play off each other to enhance the impact of both styles. What shapes the destiny of a clay sculpture if not an awareness of its beginnings and the story of its continued existence? 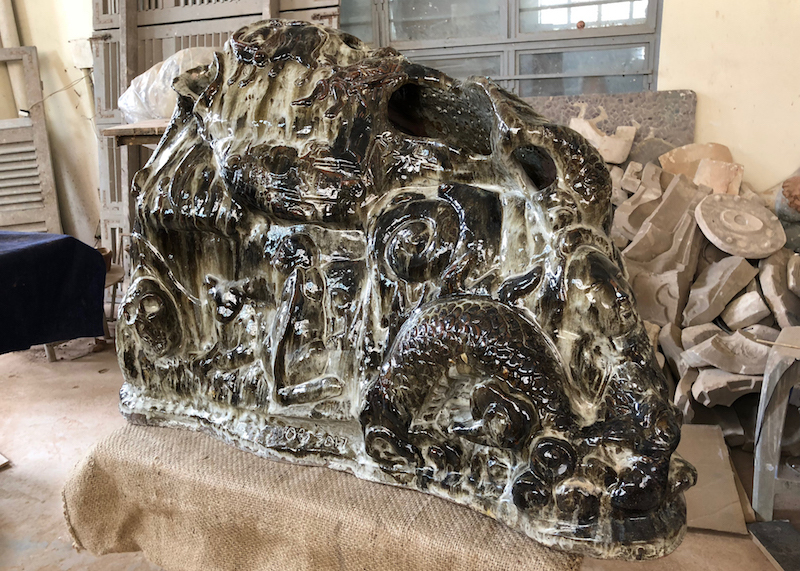 Chanh’s rejection of unblemished white clay in favor of natural earth ensures that he is more of a collaborator in the lifespan of his sculptures rather than sole creator. His clay is produced by years of natural mixing, capturing the soul of the soil along with its collected debris of trees and bones. Chanh’s hands act as just another step of each piece’s journey into the eventual fire of the furnace. 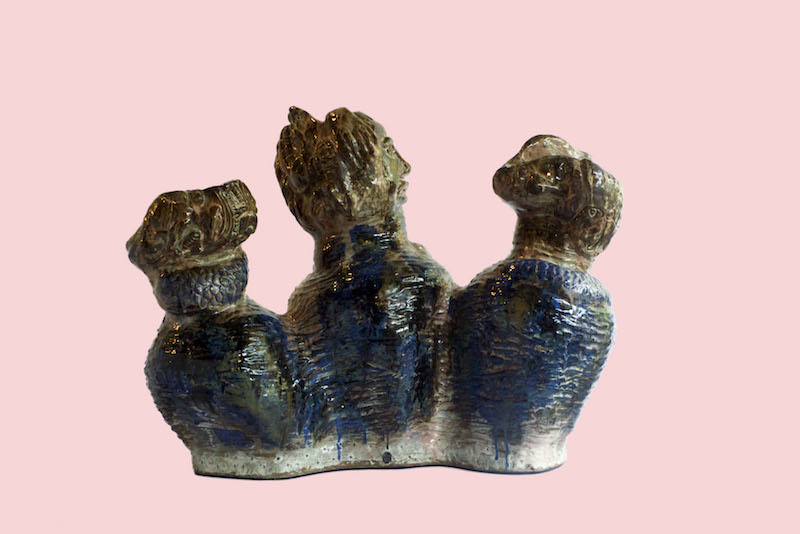 Rarely do you see ceramic art rooted so deeply in abstraction.